NextNagaland, where the neglected Kachari Ruins cry out for attention! Stupa is a hemispherical structure containing Buddhist relics and place of meditation used by Buddhists monks. In the period between the Mauryas and the Guptas the older stupas were greatly enlarged and beautified. Of these three are noteworthy—those at Bharhut and Sanchi in Madhya Pradesh, and at Amaravati in the lower Krishna valley. The word ‘Stupa’ is said to have been derived from the Sanskrit root ‘Stu’ meaning ‘to worship’ or ‘to praise’. The Stupa developed as the nucleus of Buddhist faith and worship, but its origin cannot be regarded as Buddhist for evidence of its roots date back to c. 2000 B.C. Burial mounds containing relics were raised from earth and rock according to an age old custom that had survived from as early as Neolithic times. These burial mounds were also common during the lifetime of the Buddha and he instructed his disciples to erect them at cross-roads to commemorate great kings, sages and heroes. Naturally, after the death of the Buddha, a Stupa was to be raised in his honor, and eight of the mightiest princes fought for his ashes and bones. These relics were thus distributed to eight different kingdoms and Stupas were erected over them. During Ashoka’s reign (c. 273-232 B.C. ), they were redistributed and a portion is said to have been enshrined in the Great Stupa at Sanchi. It is perhaps only in Buddhism that a particular structure has been recommended by its founder for worship and salvation, for the Stupa enables the worshiper to not only think of the Buddha as an imminent reality (by regarding the Stupa as a visual manifestation of the Buddha), but also epitomizes his enlightenment and nirvana. In this way the Buddhist Stupa transcends its predecessor, the burial mound or tumulus, by shifting the emphasis from a particular relic to a higher transcendental actuality as realized by the Buddha, i.e. the Buddha’s attainment and the worshiper’s goal. In the period between the Mauryas and the Guptas the older stupas were greatly enlarged and beautified. Of these three are noteworthy—those at Bharhut and Sanchi in Madhya Pradesh, and at Amaravati in the lower Krishna valley. The Great Sanchi Stupa is one of the best preserved ancient stupas in central India also one of the oldest stone structures in India and an important Buddhist monument. The construction work of this massive structure was commissioned by the emperor Ashoka the Great in the 3rd century BC and was supervised by Ashoka’s wife. The Sanchi Stupa was built as a simple hemispherical stone structure with a ‘chatra’ signifying to honor and shelter the relics of Buddha. Later, four ornamented gateways were added surrounding the stupa. The complex holds the famous sandstone pillar having Ashokan inscription and an inscription in the ornamental Sankha Lipi from the Gupta period. One of the most visited and most revered Buddhist structures in the world, Dhamek Stupa lies at Sarnath in the Uttar Pradesh state of India. One of the holiest sites for Buddhist pilgrimage in India, Sarnath is famous as the place where Lord Buddha had delivered his first sermon after attaining enlightenment at Bodhgaya. Built by the great Mauryan king Ashoka in 249 B.C.E., Dhamek Stupa lies inside the Deer Park in Sarnath. Bavikonda Buddhist Complex lies about 16 km from Visakhapatnam, on a hill about 130 meters above mean sea level and is an immensely significant Buddhist site. The term Bavikonda in Telugu means a hill of wells. Bavikonda Monastery dates back to the 3rd century BCE. Excavation carried out in 1982-87 revealed an entire Buddhist establishment comprising a Mahachaitya, embedded with relic caskets, large vihara complex, numerous votive stupas, a stone pillared congregation hall, rectangular halls, a refectory etc. Chaukhandi Stupa is one of the important Buddhist Stupas at Sarnath and a popular tourist site in Uttar Pradesh. It is believed to have evolved from a centuries-old burial mound. This large, ruined stupa was initially built in the 4th and 6th centuries as a terraced temple during the Gupta period. The Chaukhandi Stupa marks the site where Lord Buddha first met a group of five ascetics (who were later to become his first disciples) while traveling from Bodh Gaya to Sarnath. One of the most important monuments in Kushinagar in Uttar Pradesh, the Ramabhar Stupa is more than 50 feet high and stands on a high mound that faces the road. Ramabhar Stupa, Kushinagar is the place where Lord Buddha was cremated and he attained salvation or Mahaparnirvana. According to the facts, Lord Buddha had many discourses in Kushinagar in Uttar Pradesh. Tourists from all over visit the Ramabhar Stupa, Kushinagar which has carefully treasured the remnants of history. The Kesariya Stupa, dedicated to Lord Buddha has great significance and it is believed to date back to somewhere between 200 AD and 750 AD. This remarkable structure was discovered by the Archaeological Survey of India (ASI) in 1998. Kesariya is located 55 km north-west of Vaishali in the state of Bihar in India. It is believed to have been built to honor the site where Lord Buddha must have spent the last days of his journey while preparing to attain Nirvana. Animeshlocha Stupa is located on the north-east of the Mahabodhi Temple complex. There stands a statue of Buddha with his eyes fixed towards the Bodhi tree. Lord Buddha is said to have walked back and forth between the location of the Animeshlocha Stupa and the Bodhi tree. The Anathapindika Stupa is a beautiful stupa built by one of the leading disciples of Buddha. The literal meaning of this ancient stupa is “one who feeds the helpless”. Today, the stupa lies in ruins, but its magnificent carvings and architecture draw attention from both historians and tourists. It is believed that Lord Buddha visited Shravasti at the invitation of Anathapindika, whom he had met in Rajagaha. The Anathapindika stupa is said to have been built by him to commemorate the event. The Angulimala’s Stupa Shravasti In Uttar Pradesh In India was excavated along with other ruins of the Shravasti City in 1863. The Angulimala’s Stupa Shravasti lies testimony to the immense influence of Lord Buddha that permeated the Indian society especially in Northern India, in the pre Christian era. Angulimala’s Stupa Shravasti is named after a dacoit, who essentially must have belonged to the dredges of the society. Adurru (or locally DubarajuGudi) is a 2400 year old Buddhist site in Andhra Pradesh close to the banks of river Vainetaya. The foundation of the stupa here was laid by Sanghmitra, Ashoka’s daughter on her way to Sri Lanka. This site was excavated by Archaeological Survey of India in 1923. In 1953, the ASI conducted excavations that brought to light the remains of stupas, chaityas and viharas. The most beautiful and the most famous one is the mahastupa, built like a giant wheel with a platform with a diameter of 17 feet. In 1955, the ASI declared this a protected monument. The great stupa or Mahachaitya at Amaravati was one of the biggest in Andhra Pradesh with a probable diameter of 50 meters and a height of 27 meters but it has been largely destroyed, much of the stone having been used by local contractors during the 19th century to make lime mortar. Many of the surviving narrative reliefs and decorative plaques are in the Government Museum, Madras, and the British Museum. The foundation of this Maha-stupa must have been laid by the great Mahadeva-Bikshu emissary of Emperor Ashoka who was deputed to Mahishamandala for the propagation of the Buddhist norm. The first construction is believed to have been plain and modest. The ornamental renovations were brought later during the next seven centuries. Thotlakonda Stupa is a famous Buddhist Gompa. It is located in Visakhapatnam, Andra Pradesh. Said to be a sacred place of Buddhists during 300 BC to 300 AD, the place was discovered by the Indian Navy in 1976 during an aerial survey. The excavations conducted by the Department of Archaeology and Museums from 1988 to 1992 revealed the ruins of a well-established Theravada (Hinayanana Buddhism) monastery. Dhauli Giri Shanti Stupa, also known as Peace Pagoda, is a Buddhist structure built jointly in 1972 by the Japan Buddha Sangh and the Kalinga Nippon Buddha Sangh. It is located in the midst of the presumed site of Kalinga War in Dhauli Hill in Odisha. Encircling the Peace Pagoda lies the gore chapter of Kalinga as well as a vast gallery of rock cut sculptures, chaityas, stupas and pillars. Stupa is domed on top with mushroom-like structures and adorned with ‘speaking’ stone panels. Reclining Buddha, an elephant procession, the bodhi tree and footprints of Buddha bearing the chakra (wheel) adorn the main stone panels. Deorkothar is a location of archaeological importance in Madhya Pradesh, Central India. It is known for its Buddhist stupas and was discovered in 1982. These stupas are credited to the Mauryan emperor, Ashoka. The four Buddhist stupas that were excavated from here were made of brick. Of the four, the tallest one was around 30 feet high. The friezes had simplistic art patterns and had many depictions of animal and human images. All these patterns revealed that the stupas of Deur Kothar were in existence even before the time of the famous Sanchi stupas. Bharhut Stupa is situated between Jabalpur and Allahabad in the erstwhile Nagod state of Madhya Pradesh. It was built in 3rd century BCE and in 1873 the place was discovered by Sir Alexander Cunningham. The Bharhut stupa may have been first built by the Maurya king Ashoka in the 3rd century BCE, but many works of art were apparently added during the Shunga period, with many friezes from the 2nd century BCE. There are hardly any remains at the site now. Some of the remains of this stupa are kept in the Indian Museum in Calcutta. Dominating Leh from a high, rocky ridge, this gigantic white spired pudding of a stupa was built between 1983 and 1991 by Japanese monks to mark the completion of 2500 years of Buddhism and to promote world peace. Located on the hilltop of Chamspa in Leh, it is one of the major tourist attractions of Ladakh not only for its religious significance for also for its splendid views of the surrounding mountain ranges that it has to offer. This marvelous structure is an example of the ties between Japan and India. The stupa was built by Trulshik Rinpoche, head of the Nyingma order of Tibetan Buddhism in 1945. The stupa is surrounded by 108 prayer wheels all of which have mantras inscribed on them in Tibetan. Inside the Chorten Stupa are Kanjur holy books, relics, complete mantras and several other religious objects. The building can accommodate about 700 monks. There are several other small stupas around the main one. One of them is Jhang Chup Chorten which was built in memory of Trulshig Rinpoche after his death. Namgyalma Stupa is a Buddhist memorial honoring those who lost their lives during the freedom struggle for Tibet. The beautiful structure surrounded by prayer wheels is said to be similar to the structure built in the third century during the time of the great Emperor Ashoka. The stupa portrays an image of Sakyamuni Buddha in a small chamber. Set amidst a beautiful and lush environment, this is a very peaceful spot and many Buddhist pilgrims come here every year to offer their prayers. Popularly known as the Great Stupa, Clement Town Stupa was constructed for world peace. It is 185 ft in length and 100 sq ft in width. A two-acre lush green garden surrounds the magnificent stupa. The art work of the stupa is a magnificent example of Buddhist art. Shrine rooms with elaborate murals executed in the finest tradition of Tibetan Buddhist art need to be seen. There is a 103 feet high statue of Buddha which is dedicated to Dalai Lama. 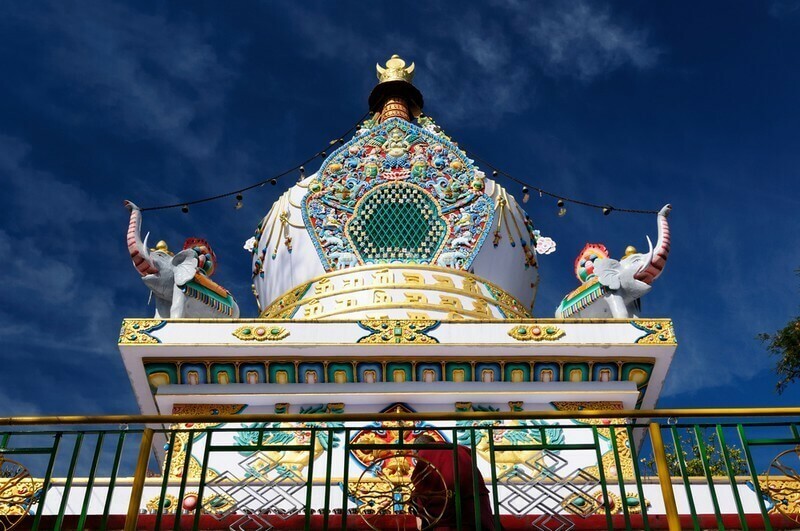 An important religious tourist destination, Gorsam Chorten is the largest stupa of the region and is situated at a distance of 90 Kms from Tawang. It is considered to be founded by the Monpa monk, Lama Pradhar in the 12th century. The peak of the Chorten has a semi-circular dome that lies on a three-terraced platform.